I work the crazy hours (around 16 hours a day, 6 days a week) because I want to satisfy the needs of my diners. Nothing makes me more happy than those few people at the end of the service who go out of their way to say thank you the food was amazing.... I live for that. During my school years, I was a kitchen hand at my local boutique hotel, Bompas of Beachport. The Chef there showed me how to make Apple Pies as well as many other various dishes. I think as I progressed and learnt more, the more obsessed with kitchen life I became. I worked in a number of high end establishments in Adelaide whilst I went to boarding school there which gave me a good insight into the restaurant trade. At the end of year 12, I started my apprenticeship at Jolleys Boathouse, learning different methods of classical styles and modern techniques. Moving into a 5 star property, Pacific International Hotel to complete my apprenticeship taught me different aspects of the catering trade. I learnt so much about wine matching with dishes as well as local and regional produce from Chef David Farmer. From there I worked with numerous Chefs, many of which I still have close contact with today. I moved around, doing work placements in Melbourne, Adelaide as well as the Gold Coast. I became a pastry chef at Mermaids in Burleigh Heads; this is where I took my knowledge and applied it to dishes that made me happy to make as pastry has always been my forte. I moved back home to Beachport in South Australia, and ended up becoming Head Chef of the seaside hotel where I was first a kitchen hand, Bompas. It was exciting to bring home what I had learnt and please the locals. 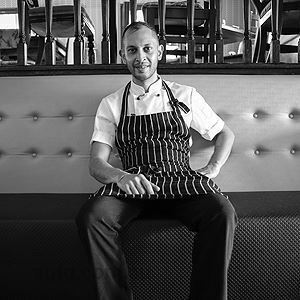 I began assisting and doing some food styling for my close friend Adam Brooks at Sails at Robe, we worked closely to develop menus and a unique style of food no-one had seen or attempted in our local area. I moved back to the Gold Coast in Early 2011, working for the prestigious Q1 Hotel Resort & Spa, then more recently Sous Chef at Helm Bistro, working directly for Executive Chef Nick Ash. Now, I am Executive Chef at Vintage Velvet, and love my job, it gives me the freedom for creativity that is bursting inside. Throughout my childhood I always grew up around amazing food that my mum had prepared for me, she was a chef once upon a time. She is the inspiration for my cookery and never pushed me into the industry. I felt it was where I wanted to be, since I was 13 I have always worked in kitchens. The buzz from service, prepping, creating dishes and seeing how ideas flow excites me. Modern Australian with classic flavours, I like simple food done well, with a contemporary feel. I try and work in with the seasons, winter flavours are amongst my favourites. Most flavours which are balanced appeal to me. The ability to please your customers, trying to exceed their expectations. I work the crazy hours (around 16 hours a day, 6 days a week) because I want to satisfy the needs of my diners. Nothing makes me morehappy than those few people at the end of the service who go out of their way to say thank you the food was amazing.... I live for that. Thyme, it’s such a versatile Herb. Vintage Velvet Chocolate Elements Plate. See the recipe here. Coominya Springs Pork Cutlet, with 7 textures of Apple.